Bentleigh got back in the winners list on Friday night after a comprehensive 2-0 victory over Hume City at Kingston Heath Soccer Complex. Valentino Yuel put together spellbinding performance leaving the crowd amazed. Yuel had his first effort of the night cleared off the line after 6 minutes. After 11 minutes Matt Thurtell headed an Arnold Suew cross back off the bar, the signs were ominous that a Greens barrage was coming. 24 minutes had past when Yuel set up the Greens first of the night. Matt Crooks slipped a ball for Valentino through the Hume defense who in turn whipped a ball across the 18 yard box which saw City defender Paul Wilson bury the ball inside his own net. Matt Thurtell had another chance just before half time but couldn’t hit the target after dispossessing the Hume defense just outside the area. The teams went into the sheds at half time with Bentleigh holding a 1-0 lead. Service resumed in the 2nd half as it finished in the 1st half and within 5 minutes of the restart Josh Barresi put a shot millimetres wide of the left hand upright after dispossessing Hume skipper Harry Monaghan inside the area. 10 minutes later it was Matt Thurtell who scored his 2nd of the season and Bentleigh’s 2nd of the night from the 2nd phase of a free kick. The initial dead ball which Hume cleared quite easily fell to George Lambadaridis outside the box who headed back into the area and Thurtell looped his header over Hume custodian Michael Weier who was off his line after punching away the initial cross. 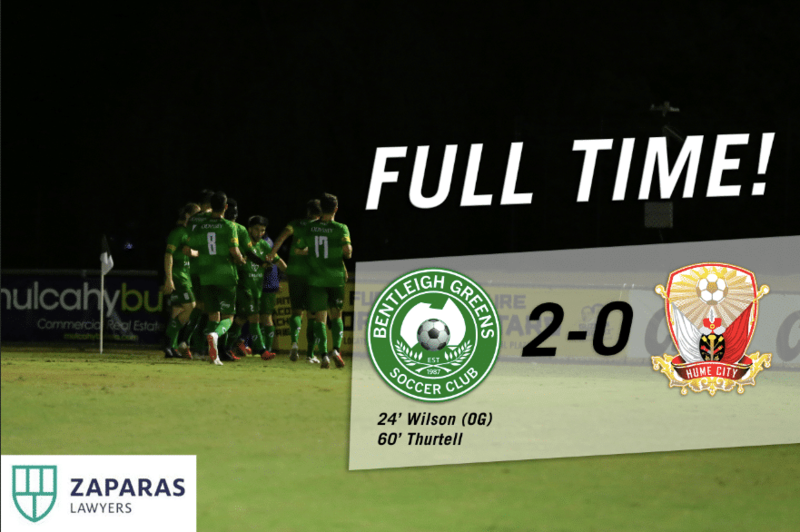 From that point on the Greens took the sting out of the match and marched on to their 4th win in the opening 5 weeks of the NPL Victoria season. The Greens travel to George Andrews reserve in Dandenong next Saturday night to take on the Dandenong Thunder at 7:00pm.